During our second trip to the MoMA Museum we looked at the "Applied Design" gallery as well as the "Designing Modern Women 1890-1990" gallery. We were asked to look at the art work and think if it is a"high functionality" or a "low functionality." High functionality objects in my opinion should serve a purpose and be helpful in our daily lives. Low functionality is something we don't necessarily need and could live without. The bed, I consider to be high functionality. The bed is ergonomic because it serves a"people's efficiency in their working environment" which defines the word "ergonomics". Yes, a person can sleep on the floor, but it doesn't give a person a good nights rest. A bed serves that purpose. 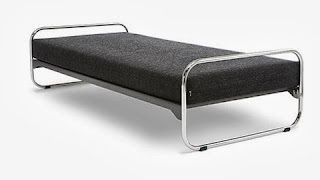 Roth didn't design a bed, he designed the bed-frame. It serves as a high functionality because it is something every household has, at least one and it is used on a daily basis... well more like night basis. "Table with Wheels (model 2652)"
The table with wheels is another high functionality because it makes labor easier. Carrying things from one place to another is now done easier, faster and without back pain. There are 4 wheels which keep the glass on a even balance as well as the objects that go on top. The table with wheels serves a similar purpose like the car. The car as well has 4 wheels which transport people as well as things from one place to another, faster. What makes the "Table with Wheels" ergonomic is that it helps people every day, transport heavy objects or multiple objects from one place to another much faster. This helps with saving time, getting more work done and last but definitely not least it helps humans with their health. A "low functionality" object I would consider it to be the slinky. It is not something we need in our daily lives. Slinky's are interesting and amusing but only for a little while. They usually get tangled up fast and just cause more nerves than amusement. Honestly, I can't find a way to make the object more ergonomic. I don't think it is a useless object but I don't think it serves any purpose and it is not good enough to last as a good entertainment. Another thing that I consider to be a "low functionality" is the scarf. No, I don't think all scarfs are low functionality, just this one in particular. 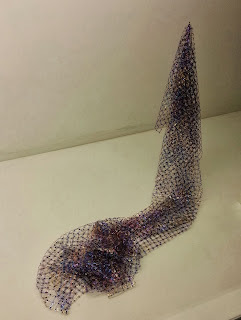 I think this would be more used to an art project than the use for a scarf. Scarf's should protect you from the wind and keep you warm something this scarf lacks. To make this scarf more ergonomic I would replace the empty holes with material such as cotton, silk or any fabric. Another thing I don't like about this scarf is that it looks uncomfortable. No, a object does not need to be high functional to be a good design. 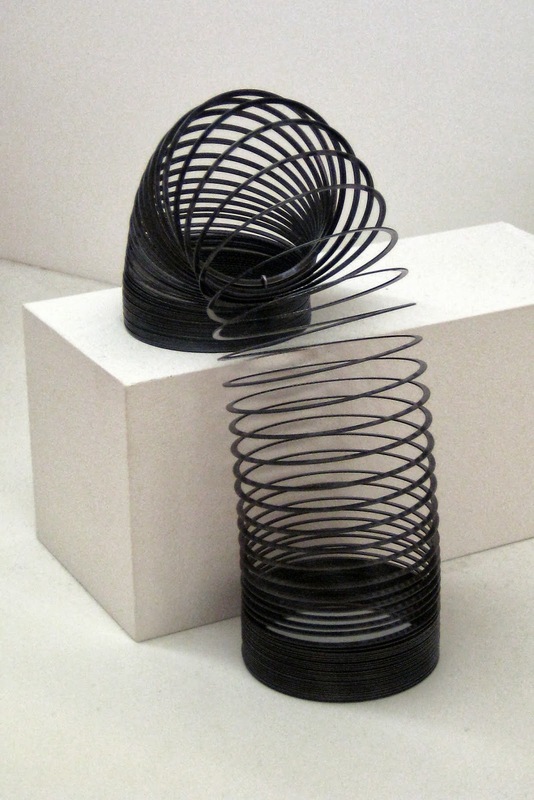 I wouldn't consider the slinky a good design but it is decent. It does serve as entertainment it just lacks the time of the entertainment. Art and design are not two separate idea. For example, posters are designed but they need art to be good. They still need to hold information but to make the poster attractive, art has to be considered. The scarf is also something designed but honestly I have used similar material to make a border around one of my projects. The ways that the piece of work skirts the line between reality and fantasy is that in reality an artist could paint a woman, the fantasy is that the woman being painted becomes alive as the artist in the paining paints her. The artist creates an illusion that the artist in the paining is painting a real woman that comes to life with the touch of his brush. 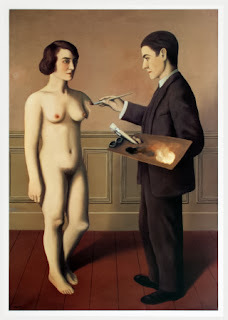 The artist uses elements of an artist using a palette and painting with a paintbrush. The way he denies our understanding of reality is that the artist in the painting doesn't creature a portrait of a person, or a painting of a human being, but an actual human being. A work of art that is created by God not by an artist and his paintbrush.